To meet someone gifting to the Archive Centre is (at least for this writer) in parts agreeable, humbling, and slightly nerve-inducing – exacerbated manifold if the materials are of personal or sentimental value. 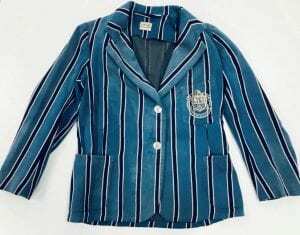 The neatly folded and dry-cleaned blazer which Doreen Blanche brought to the reading room had belonged to her late mother and was the first of its kind received to Glasgow Caledonian University Archive Centre. Pale blue with purple stripes, it was worn by students of the Glasgow and West of Scotland College of Domestic Science – colloquially and affectionately referred to as the ‘Dough School’. Later renamed The Queen’s College, Glasgow, it is a founding institution of GCU. It was a segment on the Dough School featuring Carole on ‘The People’s History Show’ that had led Doreen to get in touch. There followed a flurry of calls and emails with Carole, and a date was arranged for her to come to the reading room. Doreen could not have been friendlier. Warm and generous with her time, she was glad for the blazer to be donated to the collection. Sitting over a coffee as she signed and completed the requisite donation form, she spoke of her mother and her time at the school in the 1920s. It seemed that Agnes McColl Maclean (nee Stewart) had been quite the headstrong character. Whereas most students tended to wear the all-purple blazer it was Doreen’s contention that her mother had chosen the striped option in the shop simply as it was the one she liked best, protocol be damned! It was, she said with a smile, an act typical of her mother’s character. It is moments like this when interaction with a family member feels so vital. The sense of connection, of feeling attuned with the provenance of the materials – this, to me, is the lifeblood of archival work. Doreen was also kind enough to donate a copy of a photograph of her mother from 1951. I’m looking at it now as I write. 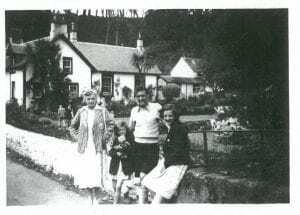 Agnes (or ‘Nessie’) is on holiday in Arran with her two young children and her brother. As Doreen writes, it was a year after her mother’s husband – Doreen’s father – had died. Nessie is wearing her Dough School blazer. It gives one pause – this blazer, all the blazers in the collection; they are not merely bygone uniforms. They were peoples’ belongings, part of their possessions. And I think on that word, possession. To inhabit or to be inhabited fully. To be imbued with an essence. These blazers that we are fortunate to have been gifted; each worn by a real person. Who was born and lived and went to the Dough School and followed their own path thereafter. Each blazer suffused with a different journey. The memories that they hold are what makes each of them unique. Each gift is kept in the Archive Centre as a named collection. Now, and future generations will be able to view each blazer and see its uniqueness. We are extremely grateful to all our donors, for allowing us to fulfil our mission of preserving the past to inform the future. This entry was posted in Archives and Special Collections and tagged Glasgow and West of Scotland College of Domestic Science. Bookmark the permalink.